I’ve said it before, but it bears saying again: potatoes are my favorite veggie. They are affordable, versatile and good for you! Especially these Creamer potatoes that I have fallen in love with. In. Love. Have you started seeing these in your grocery store yet? 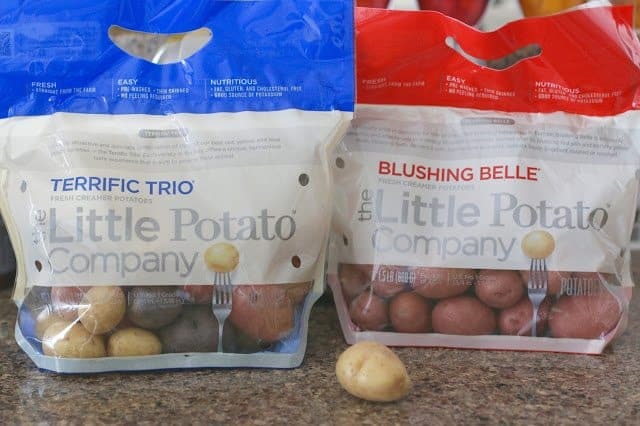 They are Creamer potatoes from The Little Potato Company and boy, are they GOOD! They come packaged four different ways. 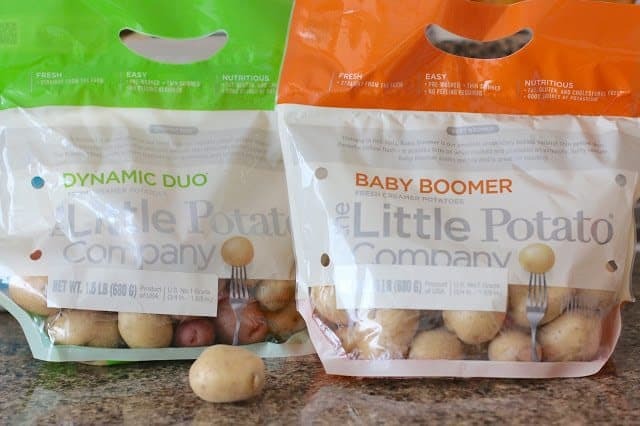 Here in the U.S., we’ve got the Baby Boomer Creamer Potatoes (orange bag below). They have a thin skin, are grown in rich soils and have a buttery flesh that just loves all those oils and flavorings that you add to them. 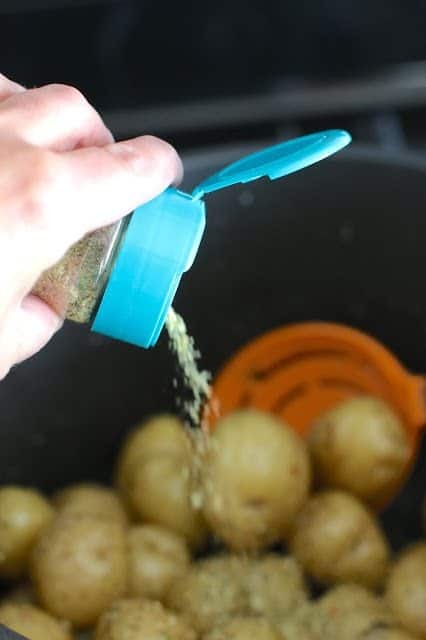 Then there’s the Dynamic Duo Creamer Potatoes (in the green bag below) that are a combo. 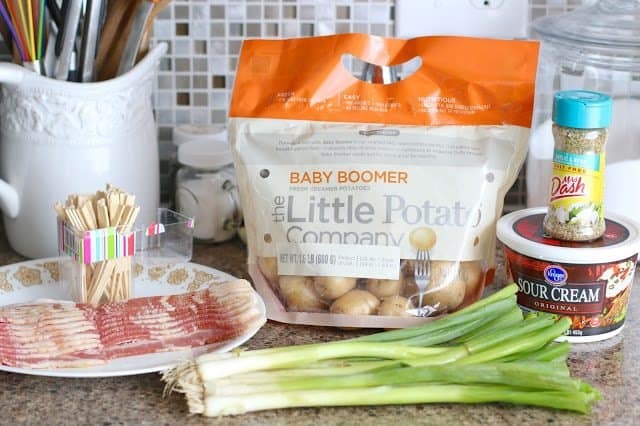 of the Baby Boomers and the Blushing Belle Creamer potatoes. These have already been pre-washed (yay!) and they’re super nutritious. Naturally gluten-free and cholesterol free. They are packaged straight from the farm – right here in the USA! 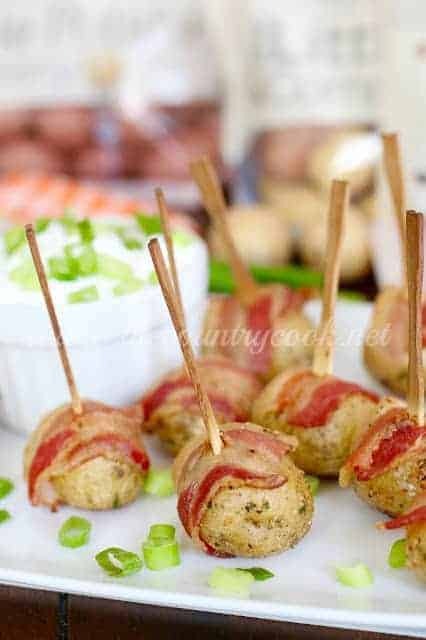 So now that you know all about the creamer potato varietals, I thought it would be fun to share a scrumptious recipe for them. 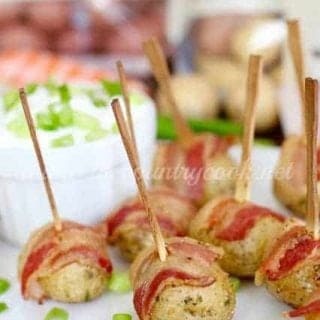 I’m going with an appetizer here but honestly, I could eat this as a dinner side too. 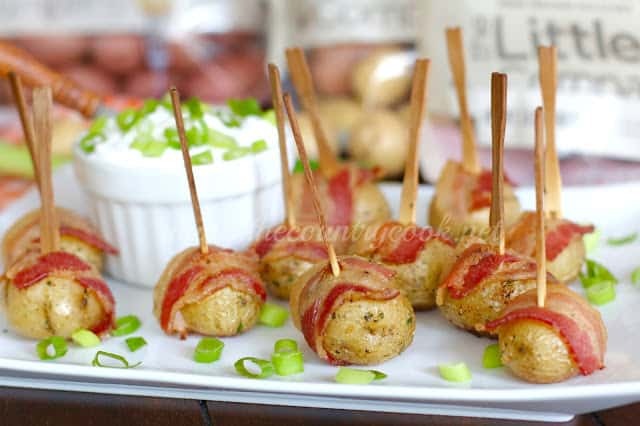 Bacon and potatoes – if loving you is wrong, I don’t wanna be right…. Get a pot of water boiling on the stove. Preheat oven to 400F degrees. Place parchment paper on a large baking sheet. Once water begins boiling, liberally salt the water. 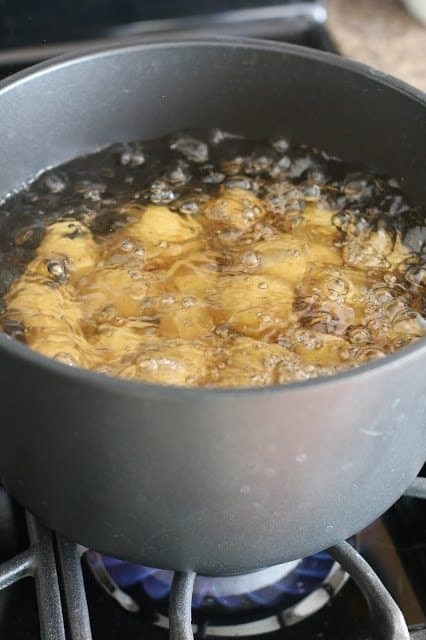 Then add the creamer potatoes to the boiling water. Parboil for 3-4 minutes. We don’t want to cook them all the way – just soften them up a bit. Slice the bacon while you’re waiting for the potatoes. 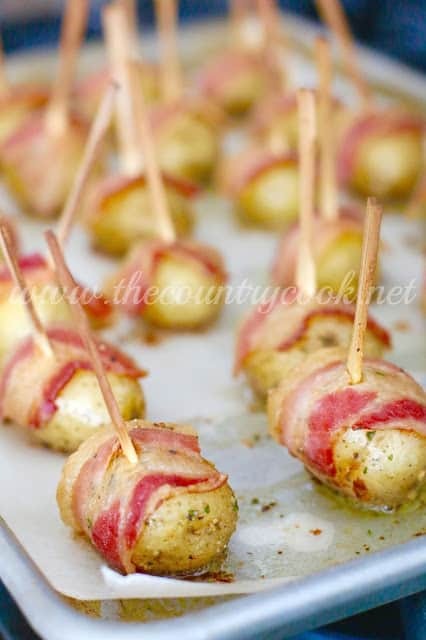 Note: I cut the bacon small enough that it lays over the potato instead of wrapping all around the potato. I think it cooks more evenly this way and crisps up better. 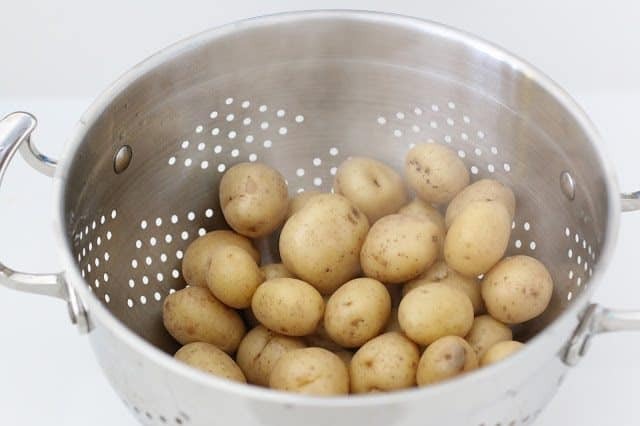 Turn off the heat, then drain the potatoes well and allow to cool for a few minutes before handling. Place them back into the pot and pour olive oil over the warm potatoes. Stir well. Then sprinkle garlic & herb seasoning over the potatoes and stir again. Make sure they are cool enough to handle. 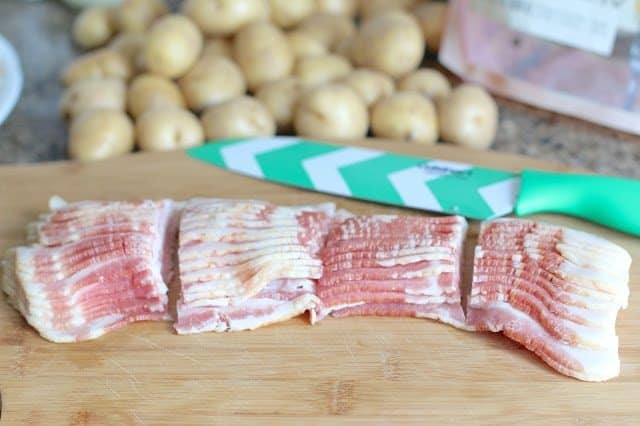 Then begin laying slices of bacon over the potatoes. 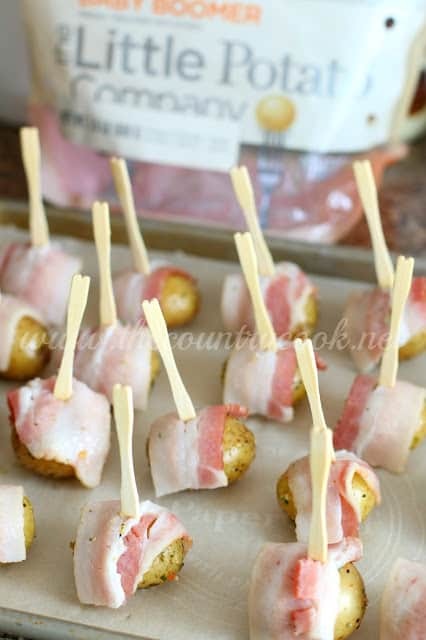 Stick a toothpick through the bacon and potato to hold it all in place while baking. Then place on baking sheet. Continue with the rest of the potatoes. Now, season the tops of all the potatoes with a bit of salt and pepper. Pop the baking tray into the oven and cook for about 20-25 minutes. You want the bacon crispy and the potatoes should be fork tender. 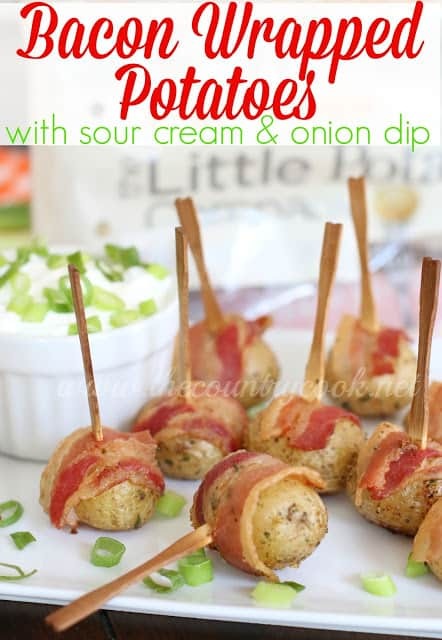 While waiting for the potatoes to cook, you can whip up the sour cream and onion dip. Combine 1 cup sour cream with 1/3 cup sliced green onions. Stir well. Serve the sour cream dip with a spoon so guests can help themselves. 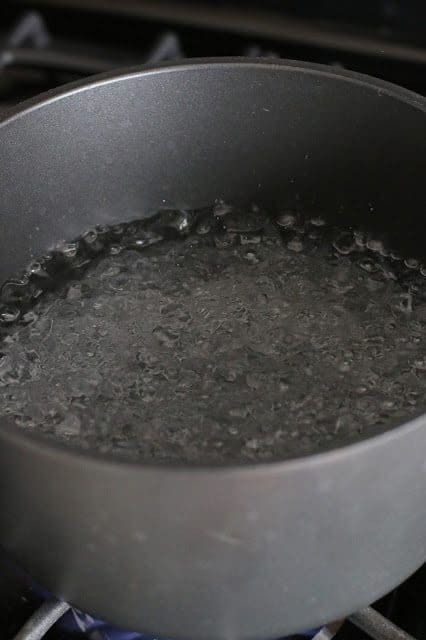 Get a pot of water boiling on the stove. Place parchment paper on a large baking sheet. Once water begins boiling, liberally salt the water. We don't want to cook them all the way - just soften them up a bit. Slice the bacon while you're waiting for the potatoes. 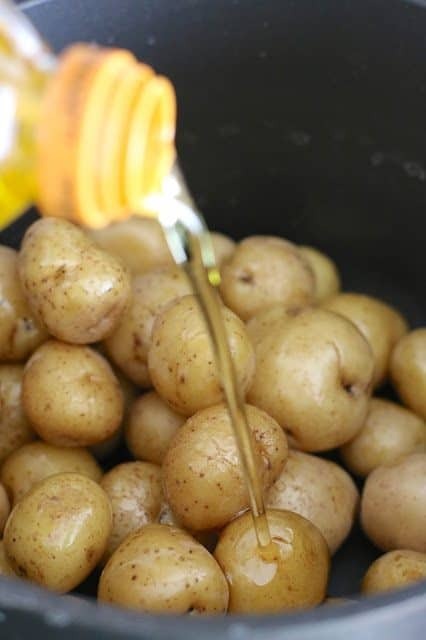 Place them back into the pot and pour olive oil over the warm potatoes. Then sprinkle garlic &amp; herb seasoning over the potatoes and stir again. Make sure they are cool enough to handle. Then begin laying slices of bacon over the potatoes. 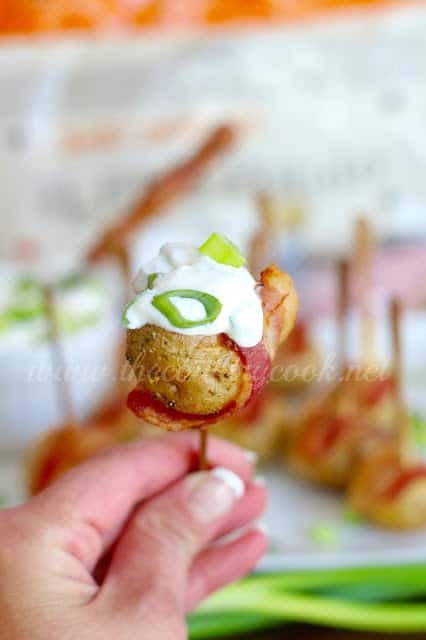 Stick a toothpick through the bacon and potato to hold it all in place while baking. Then place on baking sheet. Continue with the rest of the potatoes. Now, season the tops of all the potatoes with a bit of salt and pepper. I cut the bacon small enough that it lays over the potato instead of wrapping all around the potato. I think it cooks more evenly this way and crisps up better. 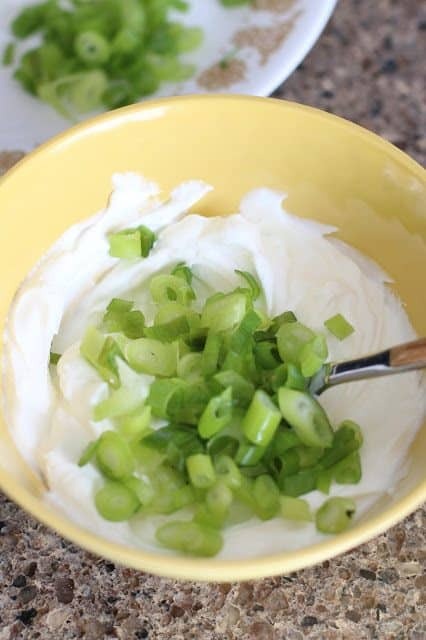 To whip up the sour cream dip combine 1 cup sour cream with 1/3 cup sliced green onions. Stir well. Serve the dip with a spoon so guests can help themselves. This is a sponsored post. I am a proud ambassador for The Little Potato Company and all opinions are my own. Yum! I am going to have to keep my eye out for those potatoes. These look delicious! Thanks so much Simon & Elva! Hope y'all love this recipe as much as we do!